Cedric MacLeod has a disease. There is no cure. But his spirits are high and he feels great. His disease is feeding families across New Brunswick, in a sustainable way, both at their own kitchen tables and in a variety of restaurants. He couldn’t be more proud of his disease – farming. “A former NSAC classmate once described farming as an incurable disease,” says Cedric. With a deep-rooted passion for agriculture Cedric couldn't agree more. "I didn’t chose farming, it's embedded in me, in my heart." 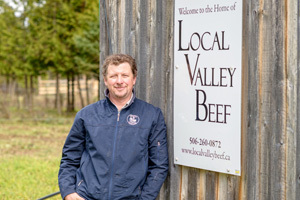 Cedric pours his heart and soul into his 105 acre beef operation in Carleton County, NB, Local Valley Beef (LVB), selling naturally produced grass fed black angus beef. One LVB cow amounts to 16- 25 pound packages. 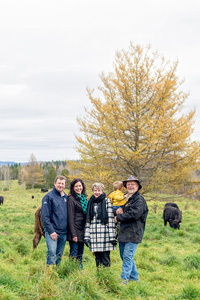 With 25 cows sold each year, LVB is providing local, sustainable, healthy and delicious meals to hundreds of residents across New Brunswick. Why can Cedric market his beef as sustainable? His production methods. A few years ago, Cedric installed a deep-well and solar powered pumping system for the cattle. Allowing the animals to have unrestricted access to clean drinking water at all times. LVB cattle remain on pasture all year long, as opposed to being fed grain. Research has shown that grass-fattened cattle produce a lean beef with enhanced flavor, OMEGA-3 fatty acids, CLAs and anti-oxidants. As a result, the cattle must have a never-ending supply of fresh grass. Cattle in the “finishing stage”, 20 – 24 months of age (nearing slaughter time), must be moved to fresh pasture each day and every three-days for the cows and calves. “Instead of big equipment and feed storage infrastructure, we have lots of fences, as well as lots and lots of fence maintenance,” he laughs. By following these processes, LVB is helping our environment. 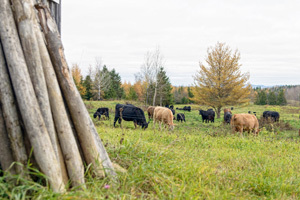 “Grass-fed allows us to use a lot of clover and alfalfa in our pastures but these plants also scavenge nitrogen from the atmosphere and make it available to other plants in the pasture,” says Cedric. In turn, nitrogen fertilizers are unnecessary. The ways in which LVB are minimizing their carbon footprint doesn’t stop there. Just as the water pump runs by solar, as does the fencing system spanning the property. “We are an off-grid farm,” he adds. Cedric also feeds hay and silage on the pasture where cows will graze the following season. Manure nutrients are deposited where they are needed and spread evenly across the pasture area. 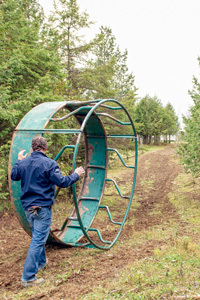 “We don’t have to start the tractor in the spring to spread manure and we get the best use of our manure nutrients possible, again reducing the need for energy intensive fertilizer inputs,” adds Cedric. Although he didn't grow-up on a traditional farm, Cedric loved animals and with his father in the construction business he often accompanied his dad when working on agricultural construction sites. "My dad often talked about my grandfather, who was in WWII, he knew the importance of food security, so always had a few animals of his own. That really stuck with me." After high school, Cedric headed to NSAC, enrolling in pre-veterinary medicine. Yet during his first year, IN101: Introduction to Agriculture changed his world. One particular day the instructor showed videos and slides on soil erosion. “That really spoke to me,” he adds. “I was seeing that happening in my hometown.” Cedric realized agronomy is where he needed to be. He immediately set his sights on soil conservation and soil health. And that’s precisely where he has landed. 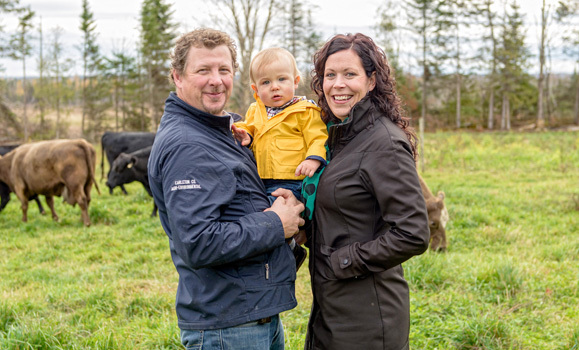 When not mending fences, improving his operation, or selling product for LVB, Cedric runs an agricultural advisory business full-time, MacLeod Agronomics. Here he thrives, specializing in international greenhouse gas and renewable energy projects, working one-on-one with growers. His goal? 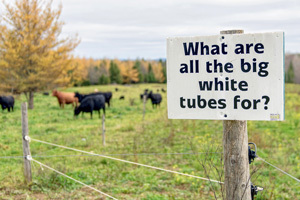 To decrease the environmental footprint of Canadian agriculture, at a profit to its farmers. Cedric is living and breathing his disease. He is VP of his local Chamber of Commerce, serves as manager for the NB Young Farmers and is president for the NB Cattle Producers.